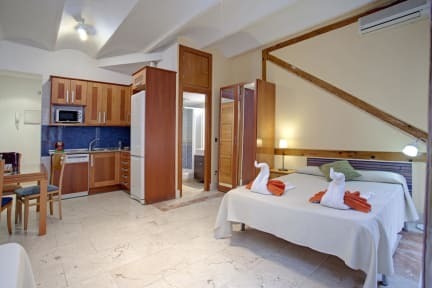 Santa Ana Apartamentos, Madryt, Hiszpania : Rezerwuj teraz! Bed types are always subject to availability on arrival. Santa Ana Apartamentos are located just few steps from la plaza de Santa Ana, one of the most famous places in Madrid. The surroundings are full of restaurants, bars, tablaos, theatres, cafes and shops. All our apartments are fully equipped for a comfortable stay; toilet with shower, kitchen, Fre internet WiFi, air conditioning and heaters. Bed sheets and towels are included. 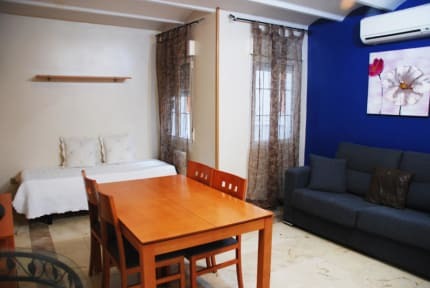 The nearest Madrid points of interest include: Puerta del Sol (300 meters), Plaza Santa Ana (20 meters), El Corte Ingles (500 meters), Atocha train station (15 min walking), Prado museum (about 20 min walking), Parque El Retiro (25 min walking), Santiago Bernabeu stadium (20 min on the metro). Check in from 15:00 to 18:00 . Arrivals at or after 9 pm: Please advise exact arrival time and call us at least 30 min before arrival so we have enough time to come meet you. We do not have a 24 hour reception. An extra 20€ fee applies to all clients checking in at or after 9 pm. Check in after 11 pm ONLY on request (30€). After 12 am, only in exceptional circumstances. Additional charges apply depending on check in time.